Mike Ullery | Miami Valley Today file art A camera operator for Indigo Life Media out of Dayton films a scene for an upcoming Piqua music video in front of the Piqua Public Library on May 1, 2018. PIQUA — Piqua city officials were recently recognized for bringing the community together in one big project last summer when they celebrated “the beauty of small town life” with a music video. City of Piqua Mayor Kazy Hinds and Public Relations and Special Events Coordinator Brittany Van Horn received the 2019 Citizen Participation Award from the Ohio City Managers Association (OCMA) for their efforts in organizing and creating the “This Small Town” music video. The video currently has almost 6,500 views on Youtube. Indigo Life Media, out of Dayton, produced the music video, which focused on life in Piqua and life in a small town. ReFlektion, featuring local twin brothers Jared and Justin Younce, created the song for the music video. “It’s fun to show to people outside the community,” Hinds said about the video. 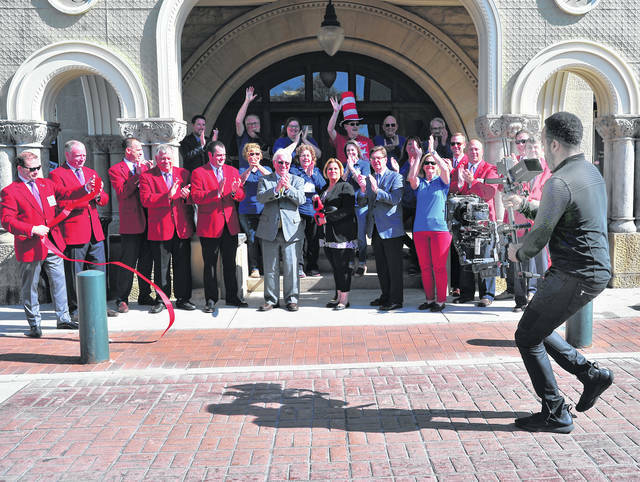 Local residents starred in the video, and filming locations included downtown Piqua, the Piqua Public Library, Lock 9 Park, and Alexander Stadium, and more. “We had so many volunteers,” Hinds said. The goal of the music video was to “celebrate the beauty of our small town,” she said, and she added that she hoped other small towns across the country could relate to the video. The idea to create this video about the city of Piqua was also brewing for a couple years before the city and other local organizations began to develop it. “This was a vision that started way before I was ever mayor,” Hinds said. Once they began the process of creating it, the video took approximately eight months to plan and create. “It was really nice to see how everybody came together,” Hinds said. The project was a collaboration between the city of Piqua, Mainstreet Piqua, Piqua Arts Council, and the Piqua Area Chamber of Commerce. It was also made possible by grants from Lungard Foundation, Hartzell Norris Foundation, and the Miami County Foundation. “On behalf of the committee, we thank all the community members who were instrumental in making this project happen,” Van Horn said. https://www.dailycall.com/wp-content/uploads/sites/30/2019/04/web1_050118mju_piqua_musicvideo-fileart.jpgMike Ullery | Miami Valley Today file art A camera operator for Indigo Life Media out of Dayton films a scene for an upcoming Piqua music video in front of the Piqua Public Library on May 1, 2018.